Each year, the Bainbridge Ometepe Sister Islands Association takes a delegation of high school students from Bainbridge to Ometepe for about two weeks. Ometepe families open their homes to the students and help them experience life in a different culture. For many Bainbridge students, it is a life-changing experience. Many of the students and their host families develop deep, long-lasting friendships. Students prepare for the trip by learning about our organization, participating in cultural-awareness activities, and exchanging letters with their soon-to-be host families. Students also participate in a service project on Bainbridge. And for the past five years, they have sponsored a fund-raising dinner and auction. The three-legged race in Ometepe’s first Special Olympics for children with special needs, organized by students from Bainbridge and Ometepe. 25 years after the first student delegation in 1990, a group of highly motivated, creative high-schoolers took it upon themselves to celebrate this momentous anniversary across both islands. On Bainbridge, they sponsored a community ivy pull to finance the 25th Anniversary activities: a Sister Islands display at the public library; an Ometepe photo exhibit at Roosters Cafe; the sale of specially commissioned anniversary pulseras; information tables at the Farmers Market; and designing and printing 500 post cards for a letter-writing campaign. They also organized a presentation by the mayor for the Health Delegation from Ometepe; gathered and delivered a suitcase full of mail from former delegates to their host families; and culminated their anniversary year by raising $25,000 at the annual student auction. A typical student delegation project involves hard work as well as joyful collaboration with the community. 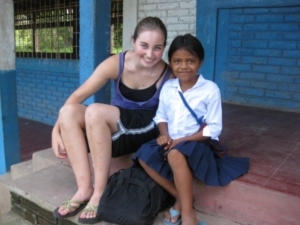 Bainbridge High School student Kendall Sanson with a student at the school in Tichana. Read one 2010 student delegate’s story. Read a report from Yes! magazine, written by an earlier student delegate. Find application forms and other delegate resources here.